The 33-foot-long (10-meter) H-2 Transfer Vehicle built and operated by Japan approached the space station from below, pausing at predetermined hold points to ensure proper alignment with its flight corridor. The rendezvous went faster than anticipated, and the HTV supply ship was grappled by the space station’s 58-foot-long (17.6-meter) Canadian-built robotic arm at 1037 GMT (5:37 a.m. EST) as the complex sailed 250 miles (402 kilometers) over southern Chile. 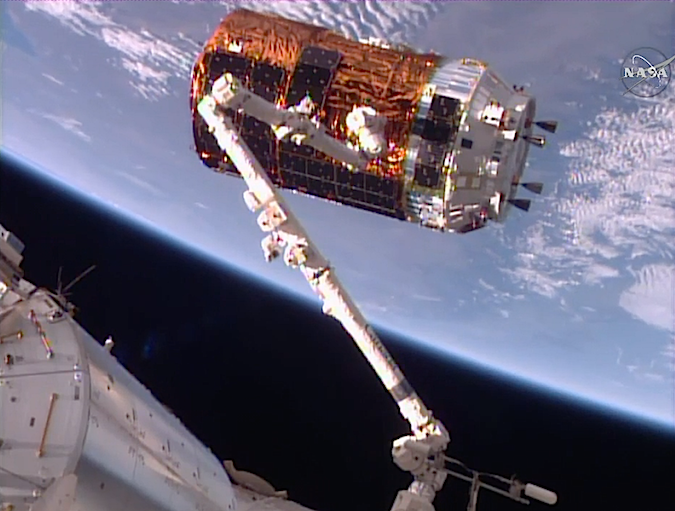 “Houston, station, we see a good capture of the HTV,” radioed astronaut Thomas Pesquet soon after the Japanese supply carrier was in the firm grasp of the station’s robotic arm. “Copy, we see the same, congrats,” replied astronaut Jessica Meir, spacecraft communicator in mission control. Shane Kimbrough, the commander of the station’s Expedition 50 crew who was in control of the robot arm Tuesday, chimed in moments later with his congratulations for the HTV ground team. “It has about four-and-a-half tons of supplies for us, which we’re really excited about,” Kimbrough said. Ground controllers took over commanding of the robotic arm soon after Kimbrough captured the cargo craft to maneuver the HTV to a berthing port on the Earth-facing side of the space station’s Harmony module. Mission control completed installation of the HTV on the space station at 1357 GMT (8:57 a.m. EST), when 16 bolts drove into place to create a firm connection between the supply ship and the Harmony module. Astronauts planned to open hatches leading into the HTV on Wednesday, but that could be moved up to Tuesday evening if the crew has time. 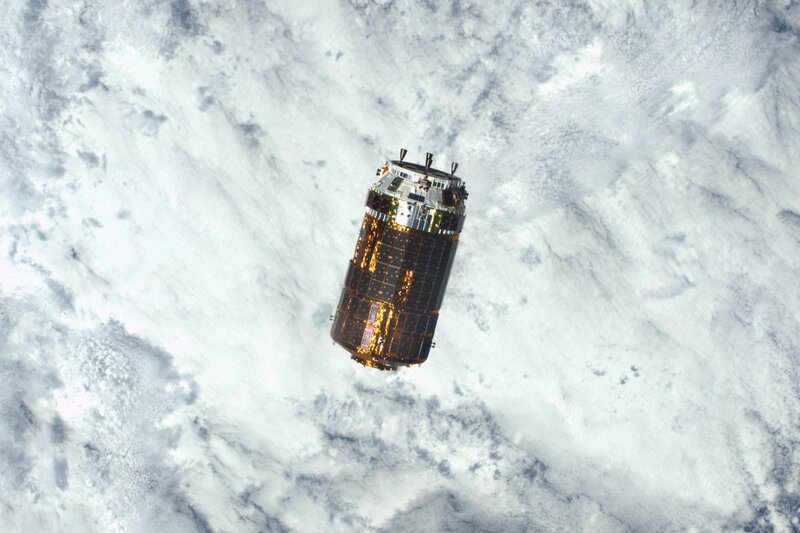 The HTV mission is Japan’s sixth resupply flight to the orbiting research outpost. The Japan Aerospace Exploration Agency pays its share of the space station’s annual operating costs with cargo delivery services, earning access for Japanese astronauts and research experiments. 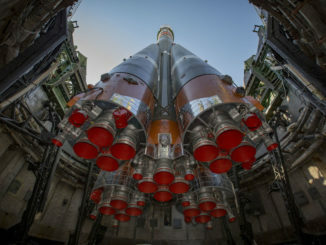 Nicknamed Kounotori 6 — the Japanese word for white stork — the logistics freighter is packed with 9,080 pounds (4,119 kilograms) of payloads, according to NASA. 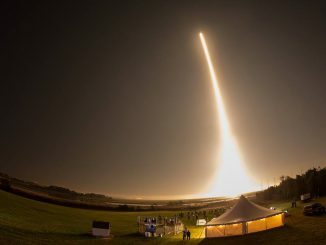 The mission blasted off from Tanegashima Space Center in southern Japan on Dec. 9 on top of an H-2B rocket. 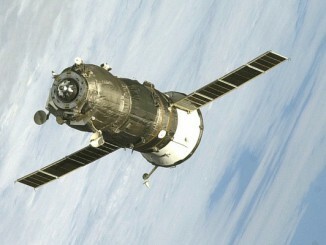 Equipment aboard Kounotori 6 includes hardware for the space station’s life support system. NASA requested the Japanese space agency deliver fresh parts for the space station’s carbon dioxide removal assembly, which scrubs carbon dioxide from the air inside the complex. 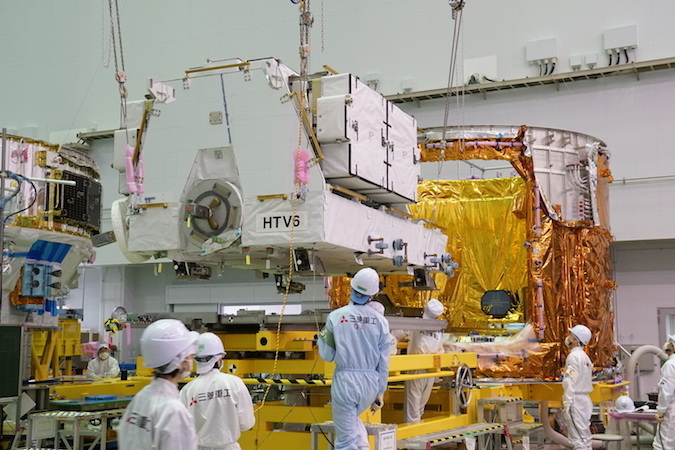 But the items aboard Kounotori 6 that will get the most attention from the station crew are six lithium-ion batteries bolted to a pallet nestled inside the HTV’s unpressurized cargo section. While astronauts inside the outpost unload the HTV’s pressurized module, the station’s robot arm will pull the pallet out of the spacecraft’s external payload bay to begin the process of replacing batteries on one of the research lab’s solar array truss segments. 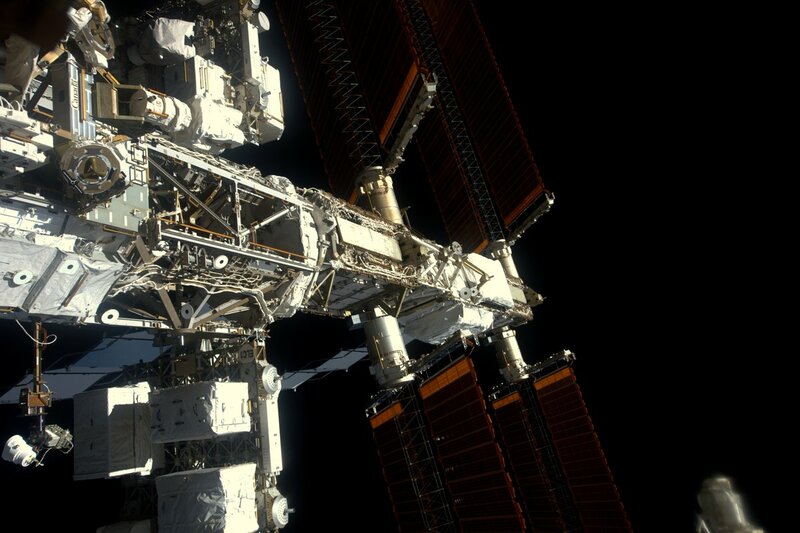 The space station has a truss backbone stretching longer than a football field. There are four solar array modules on the ends of the truss, each with solar panel wings measuring around 240 feet (73 meters) tip-to-tip to charge the station’s batteries when in sunlight. The original nickel-hydrogen batteries are aging, and the replacements that began arriving Tuesday are lighter and more efficient. “Based on a lot of the equipment thats brought up we’re going to see a lot of robotic and spacewalk activity coming up in the next few weeks, and it’s going to be really exciting,” Kimbrough said. “The vehicle has the new lithium-ion batteries that are going to get installed on the outside of the space station to improve our power system on the space station. The bulk of the battery replacement work will be done using the space station’s Dextre robotic handyman, which has two arms and a toolkit to do tasks that previously required astronauts to go out on spacewalks. Still, two spacewalks are scheduled for Jan. 6 and Jan. 13 to assist in the battery upgrade. Kimbrough and astronaut Peggy Whitson will go outside on the first spacewalk, and Kimbrough and Pesquet are assigned to the second excursion. The robotic part of the battery swap will start New Year’s Eve. The six lithium-ion batteries will go on the station’s S4 starboard-side truss segment, home base for two of the lab’s eight prime power channels. There are 12 old nickel-hydrogen batteries being replaced on this mission — each new unit has the capacity of two old batteries — and nine of the outgoing batteries will be mounted on the HTV cargo pallet for disposal at the end of the craft’s mission. The three other disused batteries will go on adapter plates also delivered by Kounotori 6 to be stored outside the station.